Without dramatic change in cities, the world will hold more than 2 billion cars by 2050, putting human health and the planet at risk. Belo Horizonte, Brazil is finding that changing the world’s car-centric culture starts in the workplace. Local governments throughout Brazil have long-struggled with how to solve the problems caused by rising car ownership, such as air pollution, traffic congestion and auto crashes. Cities like Porto Alegre and São Paulo have experimented with Traffic Demand Management (TDM) policies like license plate restrictions, increased parking prices and more, but they’ve met with mixed results. Many Brazilian cities simply lack the necessary public transport infrastructure, economic stability and political will to make city-wide TDM policies feasible. A project in Belo Horizonte offers a solution. WRI Brasil Sustainable Cities partnered with the state government of Minas Gerais to encourage more sustainable transportation habits by the workers of the Cidade Administrativa de Minas Gerais (CAMG, Administrative City of Minas Gerais). The state government headquarters employs about 17,000 people, many of whom spend more than two hours per day commuting by private car or motorcycle. WRI researchers and staff from CAMG started with a step-by-step guide on how to develop a corporate mobility plan, researching employees’ commuting habits and workplace infrastructure and transportation-related costs to develop a Corporate Mobility Diagnosis Report. From there, the two organizations identified potential opportunities for decreasing employees’ vehicle use while improving their commutes and overall quality of life. When WRI and CAMG asked workers driving cars and motorcycles every day about what would make them change their habits, 84 percent said a high-quality public transport system. Forty-nine percent said they would use the city’s Bus Rapid Transit system, MOVE, if lines connected to stations close to CAMG. So now CAMG is working with Belo Horizonte’s Transit Agency (BHTRANS) to replace two bus lines with faster, cheaper and more reliable MOVE lines. The new lines will also connect important bus terminals not served by previous bus routes, giving more CAMG workers access to public transit. These new services will start operating in late 2016. CAMG is also installing bike parking and showers for employees, and a new bike lane will connect the office to the nearest public transit terminal. CAMG is also considering implementing carpool policies and parking fees to further discourage private vehicle use and incentivize more sustainable commuting options. If done correctly, CAMG’s plan will save employees money and commuting time while also reducing car use. There are benefits for CAMG and other companies that implement TDM policies, too. Policies that improve quality of life and value employees’ time have the power to attract and retain talent. According to Fortune Business Magazine, 90 of the 100 Best Places to Work in 2014 had corporate mobility plans in place. 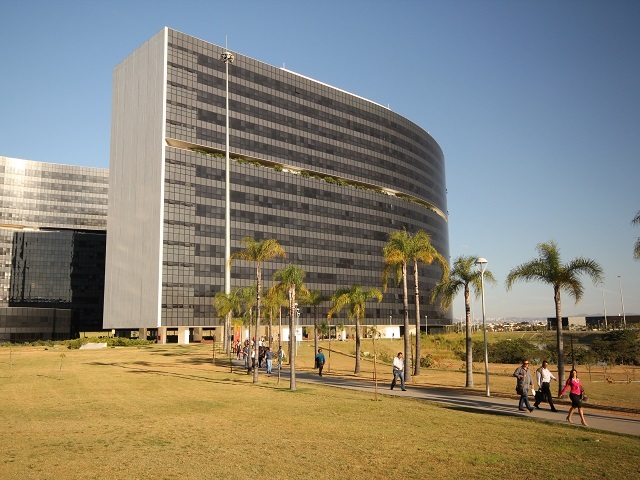 The Belo Horizonte project was not only an opportunity for CAMG, but for city officials to experience the process and benefits of a workplace TDM plan. Now, Belo Horizonte is planning to launch the first corporate mobility public policy in Latin America. The city-wide policy will require large companies to implement a corporate mobility plan in order to offset the impact of thousands of employees’ daily commutes. This pioneering policy will become an example for other Brazilian cities to follow, as well as cities around the world.